Deciding to become a veterinary technician means choosing a career that grants you the opportunity to combine your love for animals with your passion to make a difference. As a veterinary technician, you’ll work up close and personal with people’s pets, stray animals, and more, leaving a positive impact on the lives of the people and animals you come into contact with. If you’re looking to enrich your own life and career by choosing to work in a field that allows you the opportunity to continuously grow your career, open new doors, and grow your passion for animals, becoming a vet tech might be the perfect choice for you! Join us as we break down how to become a vet tech, discuss the requirements, and answer all of your vet tech questions. Depending on the organization you work with, your duties will likely vary. However, as a vet tech, it’s likely that you will assist in observing animals’ conditions, ensure animals are comfortable and taken care of, will be responsible for x-ray development and assessment, provide emergency care, and perform lab exams. You will also act as an assistant to the veterinarian in many cases, work in the research lab, and deal with feeding and caring for the animals in your facility. Before we get into the national average for vet tech salary, it’s important to remember that every facility, situation, and job will be different and will have different factors. According to research from 1Salary, it’s reported that vet techs will make a median base salary of about $36,394. Th Top ten percent of vet techs report making about $48,330, and the lower ten percent report making about $35,048. There are several factors that could increase your earning potential, such as certificates, education, and specific establishment. Vet techs are required to have obtained either their four-year high school diploma or will need to have their GED. All vet techs must have their AAs in order to become a veterinary technician. The most accepted way to do this is to complete a 2-year program that is accredited by the American Veterinary Medical Association (called the AVMA). Only three states will sub this out for on the job training — Alaska, California, and Wisconsin. Every other state requires that you have your AA to become a vet tech. Though qualifications vary state by state, you must ensure that you’re earning the necessary credentials specific to your location. The credentials are likely that you must become either a Licensed Vet Tech, a Certified Vet Tech, or a Registered Vet Tech. In 47 states — barring Alaska, California, and Wisconsin — you must complete and pass a state-approved training exam in order to become a vet tech. This test can be waived for those who have passed their Veterinary Technician National Exam in their accredited courses. Once you’ve passed the appropriate courses and exams, find a mentor, work toward an apprenticeship, or find an establishment that offers plenty of on-the-job training. Continue to gain experience and explore your career paths and options. Consider pursuing advanced certification or specialization in order to broaden your horizon. This could include, but is not limited to, taking more collegiate level courses, applying to professional organizations and certifications, and becoming further licensed and certified in physiology, lab procedures, animal handling, nutrition, and more. What Education is Required to Become a Vet Tech? All vet techs must have their high school diploma or GED equivalent, an AA in an accredited vet tech program, and have passed their vet tech national or state exams. What Certifications Do You Need to be a Vet Tech? All states — barring Wisconsin, Alaska, and California — require that prospective vet techs pass their state or national exams to become either a Licensed Vet Tech, a Certified Vet Tech, or a Registered Vet Tech. What is the Job Outlook for a Vet Tech? The job outlook for vet technicians is reported by growing much faster than the average US career. The Bureau of Labor Statistics has reported that the vet tech industry is projected to grow by an impressive 20 percent from 2016-2026, stating that the employment numbers will jump from about 102,000 to 122,400. The job opportunities for vet techs are expected to continually grow due to the demand and high barrier for entry (such as obtaining a degree and passing the credential exam). That's a higher than average projected growth of 20,400 jobs. Overall, the reported satisfaction for vet techs is listed as fairly high. With a moderate salary, high barrier for entry into the field, an a promising job expectancy, it’s no small wonder than people are satisfied with this industry. 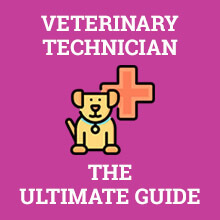 The average salary for a vet technician ranges from about $35,048 to about $40,541, with a median $36,394. The job growth outlook is incredibly high for vet technicians. It’s reported that this industry will grow by about 20 percent form 2016-2026. The education duration for this industry is a bit higher than others, requiring that you receive your high school diploma or GED, and then go on to complete your AA in an accredited vet tech program. Q. How Long Do You Have to Go to School to Become a Vet Tech? You must complete your AA in an accredited vet tech program, which typically takes 2 years. Q. What are the Working Conditions for a Vet Tech? Vet techs typically work in veterinarians offices, animal hospitals, zoos, farms, and more. Vet techs must have a variable schedule and often need to work inconvenient hours in order to be available for emergencies, such as nights, weekends, and holidays. Q. How Much Do Vet Techs Make Annually? Vet techs make a median salary of about $36,394 annually. Q. Do You Have to Have a College Degree to be a Vet Tech? You must have your Associates Degree in an accredited vet tech program. Q. What Does Vet Tech Stand For? Q. Do You Need a License to be a Vet Tech? 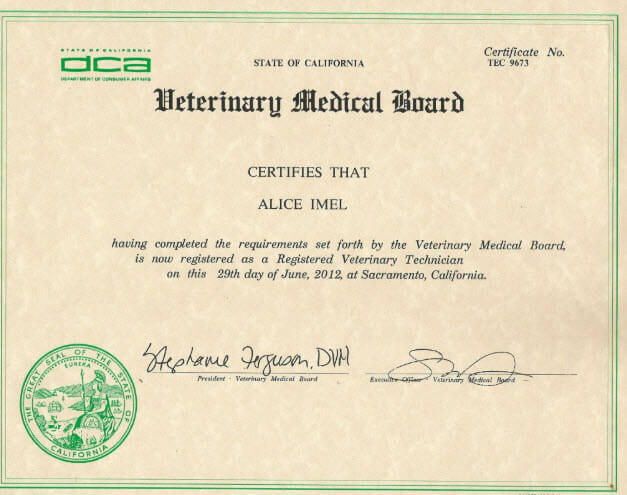 You must have your AA from an accredited vet tech program and pass a credentials exams (either by state or a national exam) in order to be a licensed vet tech. For me, choosing a career that grants you the opportunity to combine your love for animals with your passion to make a difference is what keeps driving me in the job. Though the pay is good, you just have to be a part of the job. Aw. I just love leaving a positive impact on the lives of the people and animals I come in contact with. I bet this would be an amazing opportunity for me. Depending on the organization you work with, your duties will likely vary. For instance, your duties may include checking on animal’s conditions and all that but you sure won’t handle the medical care. However, some other people in some places may be allowed to do the two. Good good, I’ve always wanted to be a vet but not the ones in direct contact with the animal’s treatment and stuff. This is pretty good for me. Jeez. The salary is so encouraging for my state. If I go for a 2 years program in this field and come out, I sure would go get a good vet hospital to fix myself in.